An investigation of a listeria outbreak from 2014 appears to have been caused by the consumption of raw milk. Here's what the CDC recommends going forward. A listeria outbreak has been linked to raw milk consumption, according to the CDC. The outbreak in question happened in 2014 and reportedly only affected two people—one in California, one in Florida—but it had very serious consequences. Both patients were hospitalized and the case in Florida was fatal. 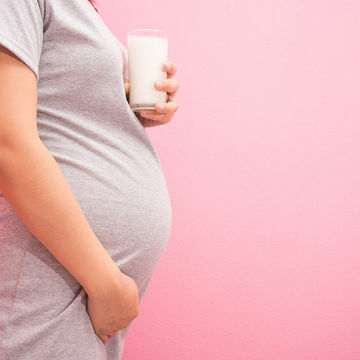 This alone is a reason to fear listeria but it's also worth noting that contracting the bacteria is a serious threat to pregnant women, who are 20 percent more susceptible to its effects. Listeriosis's symptoms include headaches, nausea, vomiting and chills in most victims. The illness can lead to stillbirth, miscarriage or infection to the fetus if it affects a pregnant woman. Local, state and federal officials were unable to determine an origin for this particular outbreak until 2016, two years after the outbreak occurred. It appears that raw milk from Miller's Organic farm in Bird-in-Hand, Penn. The FDA informed the CDC that raw chocolate milk from the farm showed genetic similarities to listeria bacteria from the infected individuals and the CDC believes other dairy products from the farm may be contaminated as well. Raw milk is exactly what it sounds like—milk from cows that has not been pasteurized. Some people believe there's benefit to drinking raw milk as it is unprocessed—but the pasteurization process is important: it involves heating the milk to a high temperature for a long period of time in order to kill off harmful bacteria. The CDC recommends that everyone consume pasteurized milk, soft cheese, yogurt and ice cream—this is especially important for anyone who is at an increased risk for foodborne illness, which includes children under five, adults over 65, those with weakened immune systems and yes, pregnant women.